Hi there! Welcome to TopNotch! This is our very first blog post, thank you if you are reading this post, and we hope that you will come back here often. So, let’s break the ice by telling you more about what we are doing. We are a premier job agency who provides top-notch recruitment services to fulfill our clients’ recruitment needs. From our humble beginning as a recruitment and consulting firm in Malaysia, TopNotch has grown along with many of our client over the years as we believe in working alongside our clients in an enduring partnership towards successful closure. If you want to know more about our company and our services, let’s check out our official website! We have been working actively offline for the past two years, but now we want to be online as well. After some discussions within the team, we decided to build a blog. We want to share and spread our ideas, observations, and researches in this blog. We wish that our articles can benefit all our readers by helping each one to generate new ideas and valuable opinions. How will our articles be like? Definitely not some job vacancies posters or brainwashing you to change a job. Look, we care about our business. But we also care about the people, the society and the world we inhabit. Our business is related to every human around us. Everyone is our potential candidate and every organization is our potential client. We speak with a lot of people each day. Our family, colleagues, neighbors, candidates and clients. Each person encounters different problems while pursuing his/her happiness. We hope that our articles can provide you some positive solutions and ideas. We will write from the business trends to leisure topics about your next vacation. Basically, the idea is like running a lifestyle magazine under our company’s name. Each week we will discover an interesting topic together. We welcome everyone to come and read and share thoughts with us. We are open to any feedbacks regardless positive or negative, but please don’t be too harsh. The first article will be published on 3rd of April (Monday) at 8 am (UTC+08:00, Malaysia’s Time Zone), then we will post an article on each following Monday. For the first article, we will discuss with you about a rising-star among Southeast Asia Entrepreneurs. This topic will be a topic series, where we will share with you a few of other remarkable entrepreneurs in future. Stay tuned! 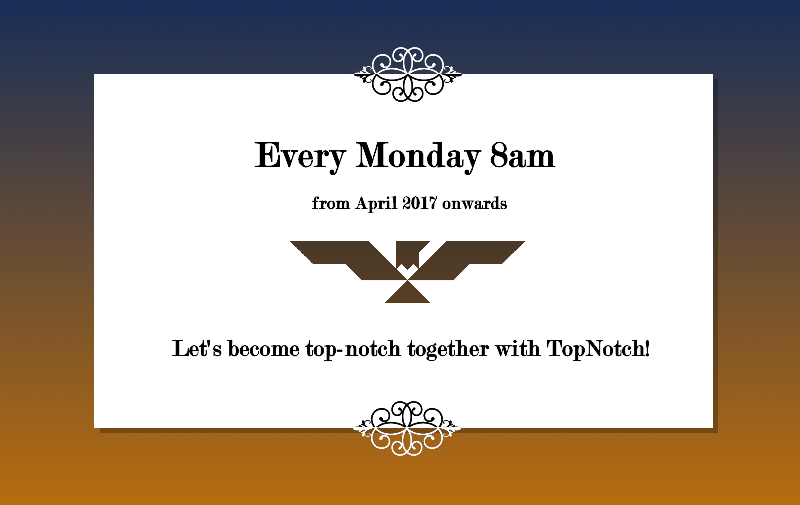 Let’s become top-notch together with TopNotch!